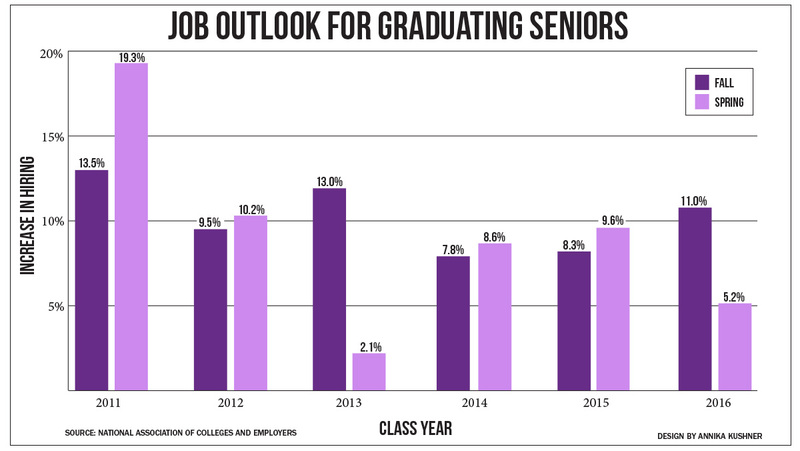 Employers are expecting to hire 5.2 percent more college graduates in spring 2016 compared to the spring of 2015, according to the Job Outlook 2016 Spring Update report published in April by the National Association of Colleges and Employers. However, while hiring activity remains positive, the projections are down from an 11 percent increase in Fall 2015, which, according to the report, is a result of a “trimming” in job postings. According to the Office of the Registrar, the college has 1,354 seniors expected to graduate in May. Meanwhile, the country’s gross domestic product has shown an increase at a rate of 0.5 percent in the first quarter of 2016, according to an article published in Bloomberg magazine this month. Trends in hiring for college graduates reflect the positive job market trends. Ed Koc, a NACE researcher, said while there is an overall good market for seniors, certain markets are going to be more favorable than others. In particular, employers are looking to hire business and technology graduates. Approximately 69 percent of employers anticipate hiring graduates from the business disciplines, 67 percent plan to hire engineering graduates, and 58 percent expect to hire computer and information sciences graduates, according to the NACE survey. John Bradac, director of the Office of Career Services at the college, said the positive job market is reflected at the college. Senior Alex Lynn, who will be receiving a history degree from the School of Humanities and Sciences, said he is not worried about being hired in the fall. Over the summer, he will be working for Challenge Workforce Solutions, a local nonprofit that works with people with disabilities to practice work skills. He also applied to the U.S. Marine Corps. “A lot of people believe that with a liberal arts major, especially a history major, it’s hard to get a job, but for me, it’s been not easy but not difficult either,” Lynn said. According to the 2016 Internship & Co-op Survey report by NACE, for students not looking to enter the traditional job market, hiring for both internships and cooperatives is down from 2015. Hiring for interns has dropped by 4.8 percent, while hiring for co-ops has dropped by 9.9 percent. Some other seniors already have long-term careers set to begin next year. Senior math education major Haley Small has several teaching positions to choose from in the fall. She said she looked for jobs through Teacher Recruitment Days run by the Central New York Career Development Association, which consisted of face-to-face introductions with employers. Small said she found this approach to meeting employers particularly useful. Senior business major Maximilian Wojcik found a job working as a senior human resources assistant at Amazon. He said he saw the job market as favorable when he demonstrated some persistence. Bradac said employers are looking for the same skills in this year’s graduates, regardless of major, that they always are. “An open mind and a willingness to learn can take you lots of different places,” Bradac said.